Laughlin is an unincorporated town and census-designated place in Clark County, Nevada, United States, and a port located on the Colorado River. Kick off your visit on the 18th (Tue): go for a walk through Riverwalk and then examine the collection at Don Laughlin's Classic Car Collection. For reviews, more things to do, ratings, and tourist information, read our Laughlin trip builder website . Los Angeles to Laughlin is an approximately 5-hour car ride. You can also do a combination of flight and shuttle; or take a bus. The time zone difference when traveling from Los Angeles to Laughlin is 1 hour. Traveling from Los Angeles in June, expect nights in Laughlin to be a bit warmer, around 80°F, while days are much hotter, around 107°F. Cap off your sightseeing on the 18th (Tue) early enough to go by car to North Las Vegas. North Las Vegas is a city in Clark County, Nevada, United States, located in the Las Vegas Valley. On the 19th (Wed), immerse yourself in nature at Valley of Fire State Park and then take an unforgettable tour with a helicopter tour. Get ready for a full day of sightseeing on the 20th (Thu): identify plant and animal life at Lake Mead National Recreation Area, then see human ingenuity at work at Hoover Dam, and then get outside with Green Valley Range. For other places to visit, more things to do, maps, and tourist information, go to the North Las Vegas online trip itinerary planner . Getting from Laughlin to North Las Vegas by car takes about 2 hours. Other options: take a bus. The time zone difference moving from Mountain Standard Time (MST) to Pacific Standard Time (PST) is minus 1 hour. In June, plan for daily highs up to 103°F, and evening lows to 77°F. Finish your sightseeing early on the 20th (Thu) so you can travel to Yosemite National Park. 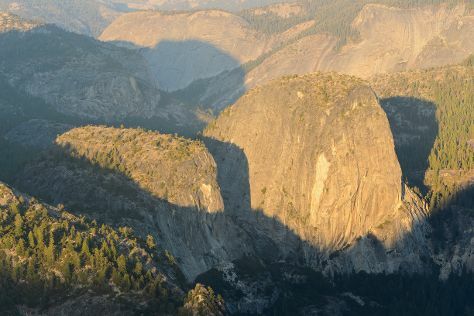 On the 21st (Fri), explore the striking landscape at North Dome, then explore the striking landscape at Glacier Point, and then take your sightseeing to a higher altitude at Cathedral Beach Picnic Area. On the 22nd (Sat), you'll have a packed day of sightseeing: see what you can catch with a fishing tour. For photos, more things to do, and other tourist information, refer to the Yosemite National Park sightseeing planner. Getting from North Las Vegas to Yosemite National Park by combination of flight and bus takes about 7 hours. Other options: do a combination of flight, taxi, and bus; or take a bus. In June, Yosemite National Park is cooler than North Las Vegas - with highs of 79°F and lows of 43°F. Finish up your sightseeing early on the 22nd (Sat) so you can travel back home.